If you love warrior-themed games and new online slots, then you are in for a treat with Legend of the 5 Ninjas. Join the 5 warriors Ka, Sui, Ku, Chi and Fu as they compete and fight for wealth, status and power. Who will become the ultimate warrior? 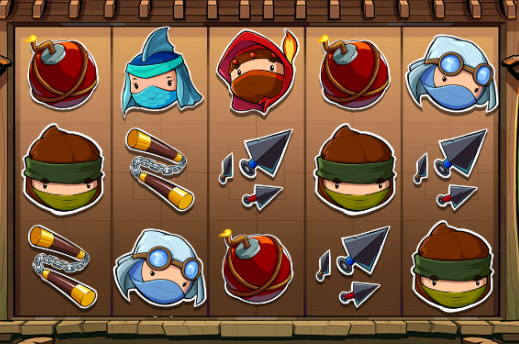 Legend of the Ninjas is a 5x3 grid slot with 243 paylines. It has an anime ninja theme that certainly stands out from some of the more basic slots out there. The 3D animations are fantastic with lots of fun warrior characters and beautiful oriental scenery. A cool, oriental soundtrack plays in the background adding a nice touch to the game. Stand out features include wilds, scatters and a free spins bonus round. If you haven't heard of Eyecon, where have you been? Eyecon is one of the most reputable online casino operators in the iGaming industry. They have been creating some of the best and most popular slots out there since 1997. Their first slot Temple of Isis still remains incredibly popular to this day. Every Eyecon slot is truly unique and eye-catching with innovative designs, entertaining features and stunning artwork. Their most popular game is Fluffy Favourites and it is regarded to be one the best slots on the market. Some of their other classic slots include Stampede, Irish Lucky and Sugar Train. If you liked Legend of the 5 Ninjas, why not take a look at these titles? Legend of the 5 Ninjas is a beautifully designed game created by Eyecon with 5 reels and 243 ways to win where you can have fun and discover more about kung fu. It's also the sequel to '5 Ninjas', so if you enjoyed that, then you will love Legend of the 5 Ninjas! In this slot, you'll join the five warriors Ka, Sui, Ku, Chi and Fu as they battle it out to become the ultimate warrior. If you guess who will win correctly, then you might be in for a great surprise. Behind the reels, you'll see a stunning oriental landscape filled with bamboo. The reels are also placed inside a beautiful Japenese building. The symbols all match the warrior theme perfectly and include bombs, weapons, swords, scrolls, and the 5 ninjas Ka, Sui, Ku, Chi and Fu. The Wild Symbol - The wild symbol in Legend of the 5 Ninjas is the wild card. The wildcard replaces all other symbols on the reels apart from the scatter to create winning combinations. The wildcard only appears on reels 2, 3 and 4. The Scatter Symbol - The ninja, also known as Godai, is the scatter in this slot. Landing 3, 4 or 5 scatters anywhere on the reels will reward you with 5, 10 or 50 free games. Free Spins Bonus Round - Landing 3 or more scatters will unlock the free spins bonus round. Once unlocked, you'll be able to choose a prize of either 20 free spins and a 2x multiplier, 15 free spins and a 3x multiplier, 10 free spins with a 4x multiplier, 8 free spins with a 5x multiplier of 5 free spins with a 10x multiplier. If you love unique games or want to be a warrior for the day, then you will enjoy Legend of the 5 Ninjas. It's a great sequel to the original game! The design and theme is so much fun. 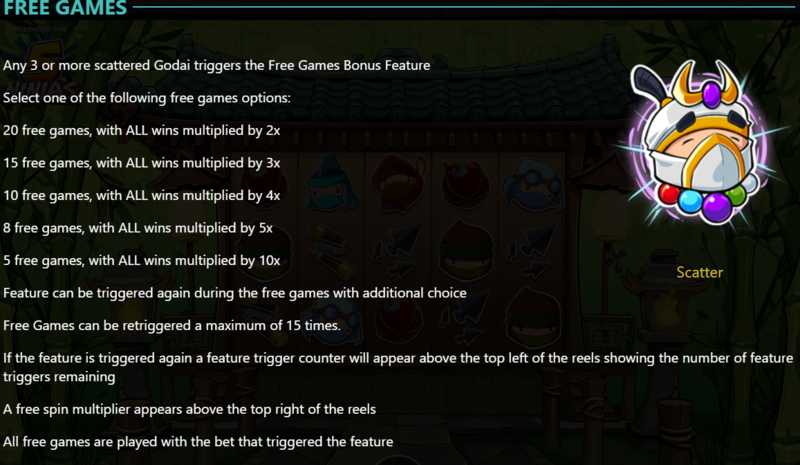 There are lots of chances to win, especially in the free spins bonus round where you can choose your prize. you can also claim new uk slots promotions here at Easy.